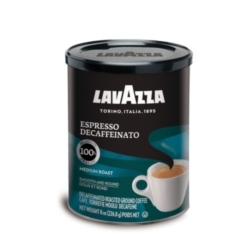 Espresso Decaf is a 100% Arabica blend from Central America with a full-bodied and sweet, fruity flavor. The natural decaffeination process keeps its distinctive characteristics unaltered. Intensity: 3. One case = �twelve 8oz cans. $0.91 / oz. $0.88 / oz. $0.84 / oz. $0.80 / oz.